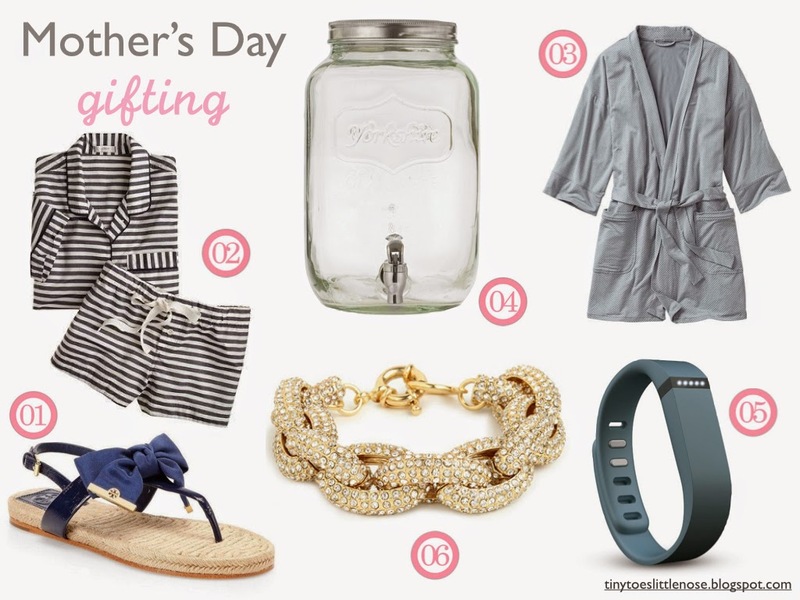 With Mother's Day coming up this weekend, I wanted to share some of my gifting ideas. This holiday is the perfect opportunity to splurge on your mom and buy her something she wouldn't normally purchase for herself. I'm a bit sad that I won't be celebrating with my mom this year, although I get to see her just 1 week later! That is a gift right there! I know that my boys will be spoiling me on Sunday, and I can't wait. I'm hoping to sleep in and then eat & drink my little heart out the rest of the day! Mimosa bar....yes please?! What are all of you getting your mamas this year? I'll take one of each please! Seriously these things are all so cute! I really love that dispenser! And sign me up for a mimosa bar too! I hope you get a fitbit!!!! Also, I have two mason jar dispensers and they're SO handy. I use them at every bridal/baby shower I help with. And that bracelet? Swoon. oooo great list, loving every single piece! i want the pjs and fitbit for myself, please! haha. i hope you get all of these things! i got my mum some disney + american stuff she obviously can't get at home. she's an easy buy ;) have a great week! Mimosa bar? Yes please! I'd also love one of each of these...especially that bracelet! Hope you have the best Mother's Day!